Over the last 7 days, the Greater New York Red Cross provided emergency assistance to 61 adults and 25 children following 36 local disasters. Here are some highlights from last week and a preview of upcoming events (see below). 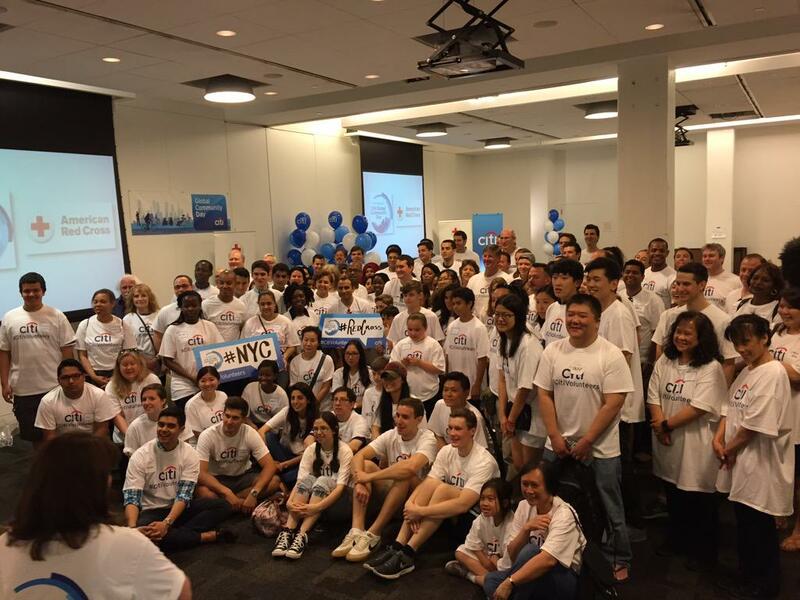 On Saturday, as part of Citi’s Annual Global Community Day, employees of Citi volunteered at the Greater New York HQ to write letters and build comfort kits to support service members in VA hospitals. Also on Saturday, Red Crossers up in Metro New York North were busy cleaning up our Middletown warehouse and pre-canvasing out in Mount Vernon to promote fire safety and sign up residents for free smoke alarms installations on June 20. Last Friday, several employees from Endurance Services helped the Metro NY North Chapter by assembling disaster comfort kits, cleaning and organizing the garage and did inventory for our on-site trailer in Greenwich, CT.
On Thursday, we posted a #RedCrossMoment video featuring AmeriCorps volunteer Riana Lewis who just returned from her deployment to a storm-stricken Oklahoma and shared what that was like. Last Tuesday, the Long Island Red Cross participated in a hurricane preparedness seminar hosted by the Township of Oyster Bay. Last week, we also posted a Flickr photo album of our Long Island Red and White Dinner Dance that was held on June 4. June 15, 17: Red Cross blood drives; 1 to 7pm; 520 West 49th Street, Manhattan. Schedule an appointment to donate today. June 15-19: Out in Greenwich, CT, Safety Town continues with the second session of its week-long program that teaches accident prevention skills to local pre-school kids before they enter kindergarten. June 20: Volunteers are needed to support the upcoming Home Fire Preparedness Campaign event on Saturday, June 20. Volunteers will be in Mount Vernon in Westchester County to install free smoke alarms and ultimately reduce injuries and deaths due to home fires. If you’d like to volunteer for the campaign, sign up on our website by selecting “Home Fire Preparedness Campaign Volunteer.” Current volunteers should sign up through Volunteer Connection.